Thanks so much to all of you who left comments on my Mom’s kitchen makeover! It was fun to read each one and I’ll be replying to each of you soon. 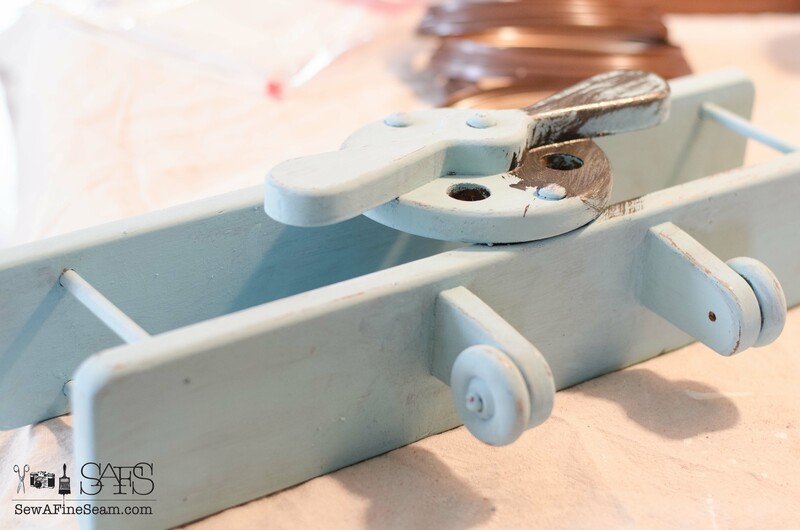 Today I want to share a bit more with you about the paint line I am carrying – Paint Couture! – yes that exclamation point is part of their name. I love that they used Couture as part of the name and it’s so fun that I get to carry and use this paint – it goes so well with Sew a Fine Seam. I have used the term couture for my sewing tutorials – couture snippets. 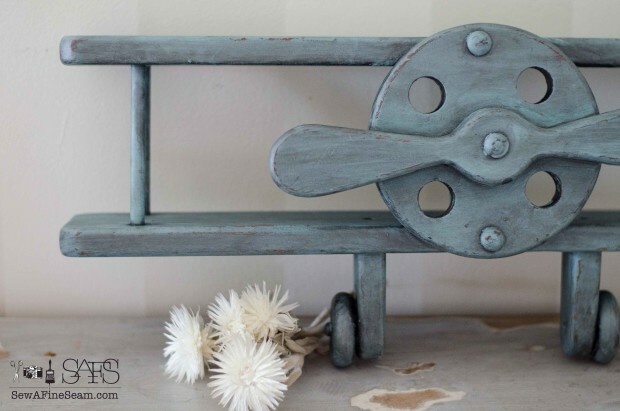 Today I’m talking about the Paint Couture! 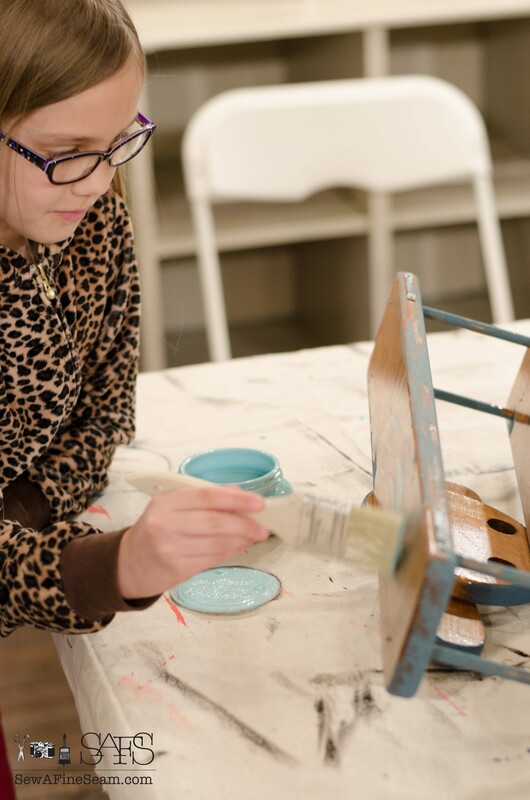 glaze that is part of the Paint Couture! line. I’ve never enjoyed the process of a wax finish. While I like the end result, the work involved in arriving at that end result is less than pleasant to me and I always dreaded it. 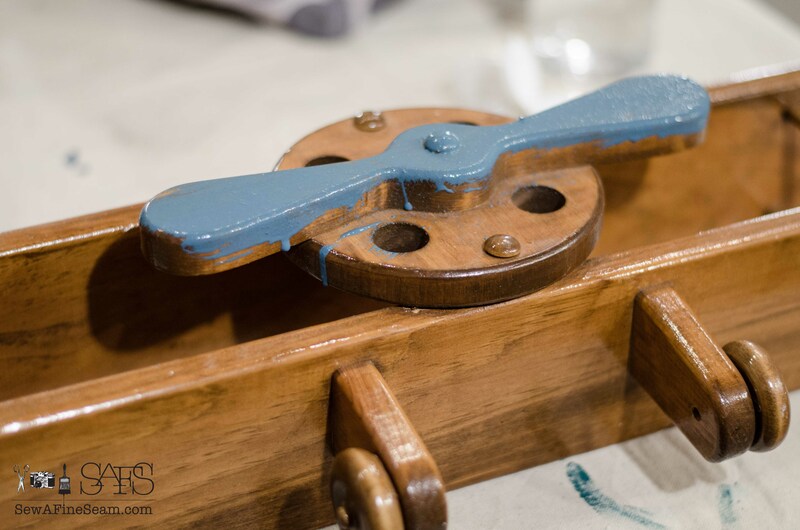 Instead of a wax finish Paint Couture offers some totally amazing glazes and lacquer. When my hubby heard me say that they had lacquer he was won over to me carrying this line of paint. My journey into the world of selling paint has been a bit rocky and filled with drama. When the first one I invested in didn’t work out due to some unforeseen issues, my hubby wasn’t too keen on me jumping on-board with another. We are still struggling to recoup the losses we had to deal with on the first one but we are doing our best to get as much as possible in stock. The more I use this stuff the more in love I am. I started this project using some milk paint that was leftover from another project. You can see in the before here that the wood airplane was rather orange-y and shiny. I applied the milk paint, Flow Blue MMSMP, and I liked how it was looking but I didn’t have enough paint to finish it and I didn’t want to mix up more. The project sat for awhile in its unfinished state, till one day I was working on some other stuff at the shop and my 9yo was with me. She wanted to paint something so I gave her a sample jar of Paint Couture in a light blue (I can’t remember the color name) and she painted it for me. I used Paint Couture! glaze in the color zinc. Applying glaze is so easy. Glaze goes on – glaze comes off. While I sometimes use the light glazes and brush them on lightly and then don’t wipe it back off, with the dark glazes I put it on and then wipe it off till it has the look I want. In this case I just played till I loved the look. Paint Couture glazes have a lot of open time (that means they don’t dry too fast and you have time to work with them and get the look you want) so you can cover larger areas and then wipe it off. If you wipe off more than you want you just add a bit more. 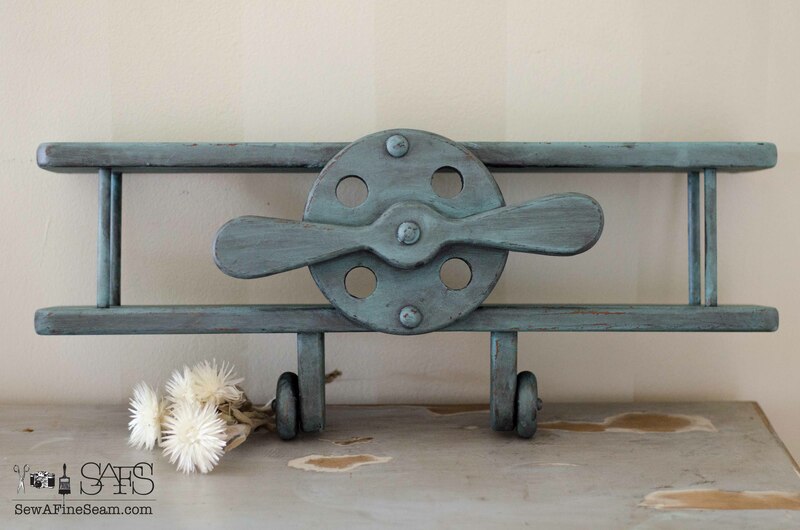 The zinc glaze gave the light blue a weathered, aged look, and created lots of interest and detail. I think this would be so cute hanging in a little boy’s room. The glazes come in lots of colors and I can’t get enough of them. I want to glaze everything I see. I never thought in my wildest dreams that I would want to be a faux finisher but I’m getting a hankering to makeover someones kitchen cabinets. The high end look you can give tired old kitchen cabinets, for a fraction of the cost of a new kitchen, is amazing. This week is the yearly kid’s clothing/garage sale a friend and I have every spring. There will be over 60 families bringing their kid’s outgrown clothes, toys, books, baby items and household stuff to sell at one location. My friend and I set up, run the sale, and clean up. Everyone drops off their own stuff and hangs it on racks we have set up for them, and then they pick up their leftovers. Most of them pick up but there are a few who donate stuff and there is always some stuff left behind. My friend and I get the leftovers all bagged up and delivered to the donate locations – it’s a big job but it’s fun and we make some extra cash at it! So if I’m a bit MIA again this week – that’s why. The monthly Project Challenge is coming up this Friday too! And I plan to have a post up as part of that so come check it out – our category this month is furniture. I had hopes of finishing up a very large project to use but I have a couple that are already finished and the photos are all edited and waiting in the wings so it will probably be one of those. Have a wonderful week and if you are local come on over to our sale! 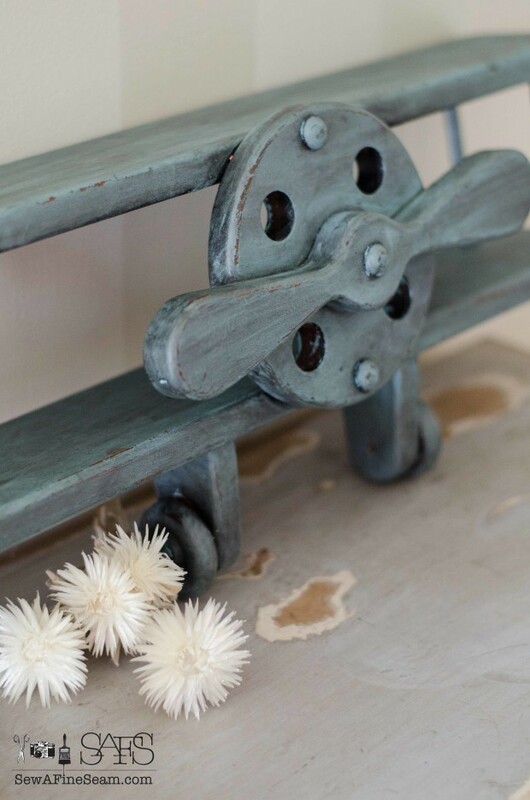 i am very interested in the milk paint and Paint Couture! I live in Virginia Beach, VA – far SE corner of VA. Do you sell these products? We were stationed in England for three years with the USAF/USN. I went crazy buying antiques and cleaning them up. I didn’t get everything redone so this will get me going. 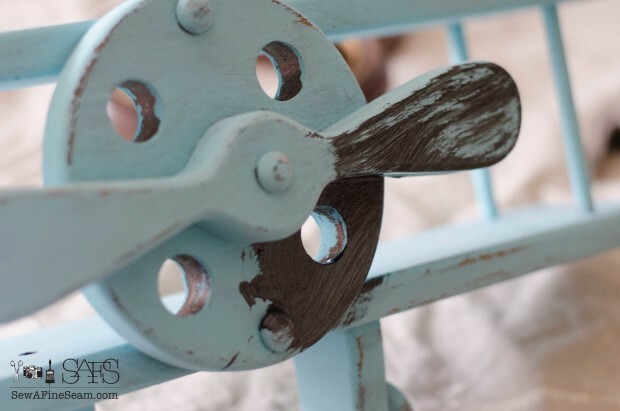 Hi Carol – yes I sell the Paint Couture and the milk paint! I love them both – they are very different paints. 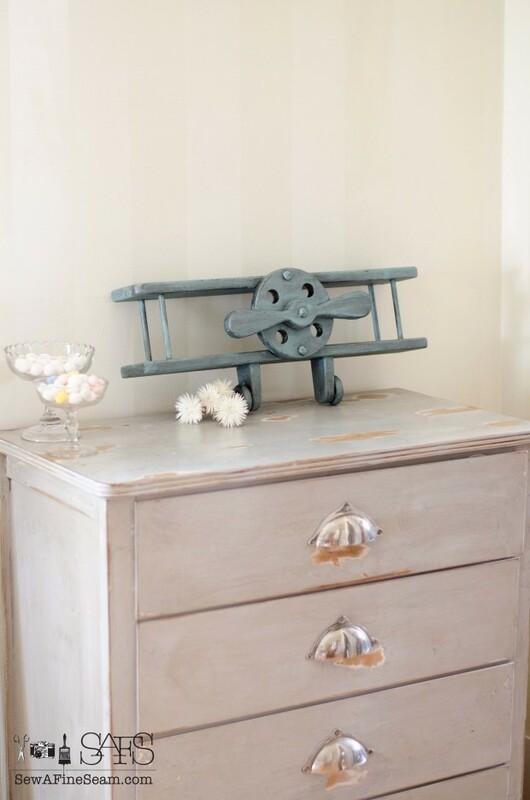 MIlk paint you use to create the authentic aged and worn look of old furniture – or like I did for my Mom’s cabinets use it on raw wood and it soaks in like a stain but it’s a paint. Paint Couture is 100% acrylic, goes on smoothly, self-levels, dries quickly with a matte finish, can be sanded smooth with 400 grit sandpaper and just a light rub over it. The glazes and lacquer available with the line for finishing your projects are just amazing – fun to use, easy to use, and beautiful when finished. The airplane turned out very, very cute! Best of times with the garage sale and I keep forgetting Miss B. is sporting glasses now! Miss B. doesn’t wear those glasses as much as she should unfortunately. Jeanie,Thank you, I made the chocolate dounts today. WOW they were AMAZING, my little tribe all loved them and thats not an easy thing to do tee-hee I sure will let you know how the vanilla ones turn out, thank you for the info. Im also going to try and freeze unfrosted dounts for on those on the go mornings, just unthaw the night before and frost in the am. try to make things as easy as I can in a g-free world!once again thanks for all your hard work!